Winter hiking can be a lot of fun. The world is often an even more beautiful sight under a light blanket of snow. A summer trail that you know well can be transformed during the winter months. However, winter hiking does bring about its own set of potential hazards and precautions you must take. Here’s a helpful list of issues you should consider before hitting that trail path. When you first start winter hiking, you should err on the side of caution and choose a trail that has a manageable distance and difficulty. You will have plenty of time to work up to the harder trails. The fact is, a simple summer hiking trail can and will be a very different affair in the midst of winter. You could find yourself dealing with slippery ice filled crags, snow lodged paths, or even an avalanche. Wading through waist deep snow will not make for a pleasant experience. Also, understand that the amount of daylight hours will be much shorter. You do not want to start late and end up stuck on the trail after dark. That’s how accidents occur. Wearing multiple layers is one of the most important things you can do when hiking in the winter cold. Not only will layering up help keep you warmer, you will also be able to better regulate your body in relation to your environment. Simply put, the temperature at the bottom of the trail will vary to that of the summit. When you dress like an onion, with multiple layers, you can take off clothes and put them on as and when you need. If you have space in your pack, a spare jacket and fleece pants is a worthwhile backup should the weather really turn. When winter hiking, remaining dry and warm will make for a far more enjoyable day. You should be aware of the weather outlook, before you leave for your hike. You should also pay attention to what the weather is doing as you hike. To prepare you should make efforts to ascertain predicted rain levels for the day, wind speeds and daylight hours. Also take care to see if there have been any avalanche warnings. This information is easy to find online for most hiking destinations throughout the US. The best, most sensible action to take is to only winter hike when the conditions are favourable. If they seem otherwise, postpone your hike for another day. Whether you are a winter hiking newbie, or an experienced trekker, hiking with friends is always the best way to go. Not only is it more enjoyable, during a winter hike, where potential hazards are more numerous, having a friend there could end up saving your life. Furthermore, an experienced friend will be able to help throughout the planning stages too; the appropriate trail to take, what gear is required, etc; these questions can be answered more confidently if you are going with a friend with prior knowledge of the route. As an added precaution, make sure you have someone at home that is aware of where you and your hiking buddies are going. First, you need to make sure you have the correct gear for the hike. Secondly, you need to know how to properly use it. When winter hiking the best precaution you can take is to pack as if you might be caught overnight. At least one person in the group should have emergency gear in case you are stuck on the mountain; a bivy sack, sleeping bag, down parka will make a big difference if you’re stuck up the mountain. While we have already mentioned the need for suitable clothing and the basic gear that you should take, when purchasing your equipment do not opt for the cheap brand options. While it may be tempting to spend less and get everything you need in one go, you are better off waiting until you have the funds to buy the right, quality equipment from the start. End-of-season sales and coupons can really help here. You will find that better quality equipment will last a lot longer, and at critical times much less likely to fail. Better equipment will make for a safer more comfortable winter hike, and that’s exactly what you should be aiming for. Don’t make life difficult for yourself and leave for your hike on an empty stomach. While you shouldn’t pig out on a 3-course meal 30 minutes before starting your trail, it is a good idea to have a hearty breakfast before you drive to your location of choice. Likewise, you should pack a good lunch and have suitable emergency rations for any mishaps. Likewise, after finishing your trail you are likely to find a restaurant or bar at the base of the pick. These are intended for hikers to reward themselves after a good day on the trail. It’s always a pleasure to relax and indulge in a big meal in a warm and cosy atmosphere like this. Getting to the top of a mountain trail is optional. The vital part is getting down. If that means turning around while on route than so be it; the mountain has been there for aeons, you will get another chance. While this may sound obvious, it is amazing how many people keep on going when the safer and more reasonable option is to turn around. The mind-set is one of defeat and turning around shouldn’t be seen that way. If you run into conditions that look dangerous, you should always consider turning around as an option. Furthermore, you should always ensure that you have time and energy left over for the descent. An experienced winter hiker will focus on the entire trip, not just the ascent. Using crampons is an important skill to master if you plan on doing a lot of winter hiking. For one they will make terrain a lot more accessible. However, if you use them the wrong way you could end up injuring yourself. If you haven’t used them before, once you have bought a pair, try them out on a nice and easy trail first. You should also take the trail slowly as you get used to having the crampons on your feet. It goes without saying that you should bring plenty of water with you. Dehydration is a problem, and if you are forced to start overnight, you will want the added security of having enough liquids. A nice thing to do is to also have a warm flask of tea, coffee or hot chocolate. A lovely hot drink to warm up the cockles will go a long way to increasing your comfort levels. 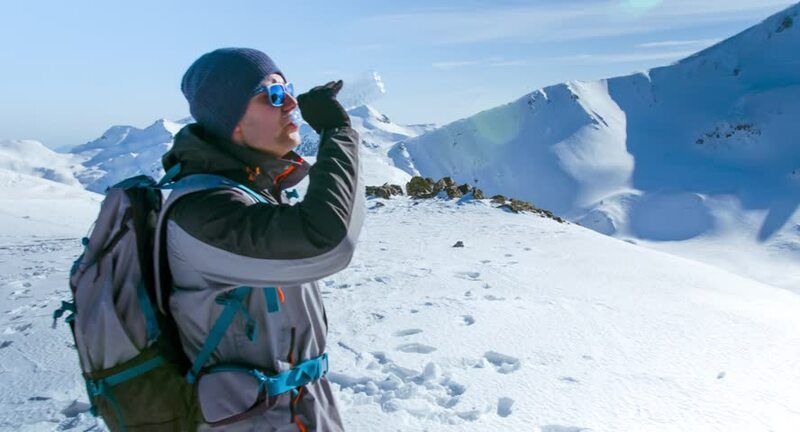 And what better way to enjoy the view when you reach the summit, than to have a hot cup of tea clasped in your hands.